Almost everything about Smalltalk and its history is too fantastical to believe, and of all the references on Smalltalk, this book provoked the most longing sighs. The denouement of the book is of course the implementation of the Smalltalk interpreter in Smalltalk, which is in many ways a star-map to a world much like our own, only better. Thinking back on all of the programming books that I’ve read, I would be hard-pressed to think of one that was more influential on my personal programming style than Leo Brodie’s Masterpiece. While Thinking Forth motivated change in my micro-level programming stylings, CTM definitely influenced my macro-level systems-level thinking. CTM is a book that I’ve read a few times and each time that I do I discover something mind-bending. I suspect another read-through is forthcoming. 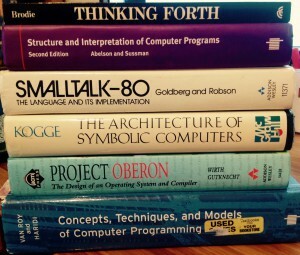 Wirth’s magnum opus is the quintessential example of Computer Science alternative-history world-building. A science fiction companion to this book: Perdido Street Station and the world of New Crobuzon. While Wirth’s Oberon system and language is comprehensive and unique, it does tend to fit into our known computer science universe. However, Kogge’s book describes languages and systems that seemingly turn what we know of hardware and software on their heads. SICP is an exploration of programming free-love. Indeed, the tone, examples, references, and hearken to a programming life that if true, would be an absolute blast to live in. Of course, SICP and its contained dictums do not outline a utopia. Instead, they point to a method of working that demands a lot, and likewise provides proportional reward. However, like many great works in this vein, one eventually stops reading and returns to the harsh reality in which they operate. Fortunately for us, SICP contains a formula for revolution. What are your favorite works of Computer Science-Fiction? “Probability Theory: The Logic of Science,” because the probability you understand probability without reading this is 0. “Learn to Program X in 21 Days” can be the low grade potboiler science fantasy books with lurid covers that promise far more than the contents deliver. McCarthy’s original LISP paper was pretty amazing, which I discovered while reading Ian Piumerta’s Maru source code (also pretty Computer Science Fictiony), even though I read it many many years after he wrote it. Then, just when I thought LISP and Clojure were the most magic (I still do think they’re pretty magic), I encountered “Programming in Haskell”… Oh… My… God. :) So good. ‘The New Turing Omnibus’, along with ‘the magic machine’ and ‘the armchair universe’ by AK DEWDNEY really appealed to the young (Science fiction Reading) me. The current (older) me just had their mind blown by ‘Self’- but there is no book. I’d suggest that van Roy & Harid’s CTM would be better matched by the works of Jack Vance on the diversity of the Gaean Reach. K&R first edition. It starts with “Hello, World” and a hundred or so pages later you’re doing low-level Unix filesystem manipulation. The Art of the Metaobject Protocol. Given enough rope, anyone can shoot themselves in the foot. CTM of Peter Van Roy & Seif Haridi. Incredible book. Great MOOC on edX: Paradigms Of Computer Programming. An eye-opener! Good point about missing companions. The two for my above: “The Cat Who Walks Through Walls” and “Do Androids Dream…”, respectively. Stepanov’s and McJones’ “Elements of Programming” opposit Herman Hesse’s “The Glass Bead Game” (which might not be considered Computer Science-Fiction in the classical sense, but still …). As luck would have it, I just spent the weekend getting ETH Oberon (nee “System 3”) from December 2000 running on my ThinkPad T20. The T20 has a three-button tracepoint so using Oberon on it is reasonably natural even without an external mouse. Ah, the memories. It was trickier than hoped because the SSD I chose to use was, at 64 GiB, far beyond the size that the BIOS, DOS or Oberon really know what to do with. The maximum heap size of ETHOberon appears to be 192 MiB. This is an insane amount of heap for a typical Oberon installation. Still, even if you allocate 100 MiB worth of binary tree notes and then let the stop-the-world mark-and-sweep GC rip, it only hiccups slightly. Funny thing: I don’t know if it’s this hardware or Oberon that’s doing it, but it makes a quiet noise between chirping and buzzing whenever it’s actively computing something, so you can actually hear the garbage collector run if the collection is large enough. “e” and “k” aren’t even close to each other on the keyboard. autocorrect? Vahalia’s “UNIX internals: the new frontiers” (where “new” means circa 1994). Each chapter is basically: here’s a classic problem in operating systems, and here are three different systems to solve it, at least one of which is batshit crazy and at least one of which includes “let’s invest $100M in a new generation of microprocessors to solve this better.” It may be more “computer historical fiction” than science fiction, but still fantastical. How about the 6 books spoke of in the movie Hackers?